This tour focuses on the archaeological ruins and the findings from the sites of excavations. Inside Ephesus Ancient city, you are going to visit: Odeon, Domitian Square, Memmius Monument, Nike, Hercules Gate, Curates’ Street, Trajan Fountain, Latrines, Brothel, Library and the Grand Theatre. 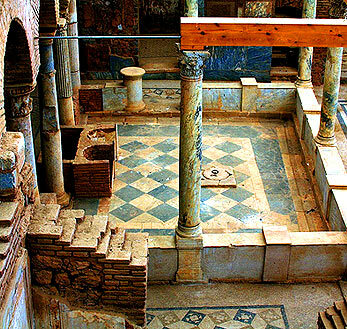 The Terrace Houses is a section inside Ephesus Ancient city that has a separate entrance fee. The Temple of Artemis used to be one of the seven wonders of the ancient world which is entirely in ruins today. Ephesus Archaeological Museum is the local museum of Ephesus with findings from the terrace houses, busts and statues, old coins and medical and cosmetic tools.